The Barbour Portishead Tee is perfect for this season, crafted from 100% cotton, this super soft, lightweight t-shirt will definitely be a summer must have. 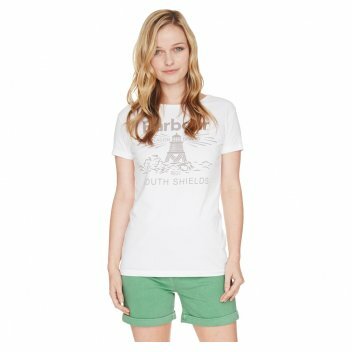 This regular fit tee features a vintage print Barbour Beacon emblem on the front with a very flattering wide neckline. The Barbour Portishead short sleeve t-shirt will make a great addition to your casual summer wardrobe. We think the portishead t-shirt looks great teamed with Barbour's Gorleston Trousers for a stylish summer outfit.